Last week was the 7th week of the 2019 legislative session. There are 11 weeks remaining in the regular session. Here are the highlights from Senate floor action from last week. MEDICAL HISTORY INFORMATION FOR ADOPTED CHILDREN – The Senate passed S. 181, a bill that would allow adopted children to learn of the medical history of their biological parents if the parents consented to that disclosure. The bill will now go to the House of Representatives for consideration. PUBLIC DISCLOSURES REGARDING CHILD FATALITIES – The Senate passed S. 211, a bill that would authorize DSS to release information regarding fatalities and near-fatalities involving children. The bill now goes to the House. ASSISTANCE FOR STUDENTS OF COLLEGES THAT CLOSED – In 2018 Virginia College and the Golf Academy of Myrtle Beach closed down even though students were enrolled in programs at those for-profit higher education institutions. 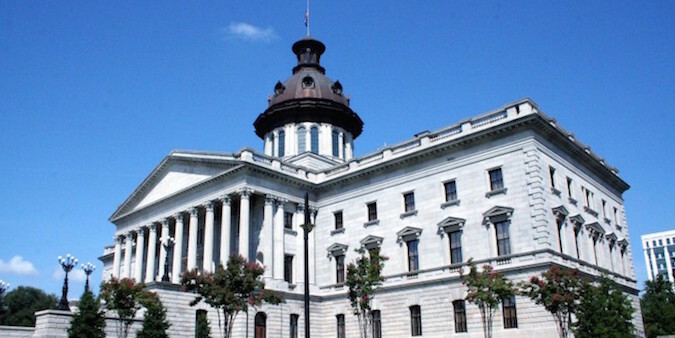 Last week the Senate passed H. 3697, a resolution that would allow those students to complete their education at other colleges or universities in South Carolina without penalty. TAX LIENS AVAILABLE ON THE INTERNET – The Senate passed S. 160, a bill that would allow the Department of Revenue to file tax liens online rather than having those liens filed in various courthouses across the state. If the House passes the bill, it would be much easier to search for tax liens from DOR. NEW ADJUTANT GENERAL – Historically, South Carolina has elected the Adjutant General. However, in 2014 voters approved a constitutional amendment to allow the Governor to nominate the Adjutant General following the 2018 election with advice and consent of the Senate. Governor Henry McMaster nominated General R. Van McCarty as the first Adjutant General under this new constitutional provision. The Senate confirmed Gen. McCarty’s nomination last week. INCOME TAX CREDIT FOR MEDICAL TRAINERS – The Senate passed S. 314, a bill that would allow doctors, nurse practitioners, and physician assistants to claim an income tax credit for volunteering as preceptors for clinical rotations required for medical students. The House will now consider the bill. On Monday night, I attended the “State of the Valley” at Midland Valley High School. The event served as an to review the school’s achievements and introduce the new head football coach, Kenny Freeman. Tuesday was Leadership Aiken County day at the statehouse. Wednesday was the annual FFA day at the statehouse. I enjoyed being able to spend some time with FFA students from Midland Valley High School, Ridge Spring-Monetta High School, Strom Thurmond High School, Gilbert High School, Saluda High School, and Piedmont Technical College. Wednesday was also USC-Aiken day at the statehouse. I joined other Aiken County legislators in talking with students about USC-Aiken’s impressive achievements. On Wednesday, representatives from county councils across South Carolina visited the statehouse. I was able to spend a few minutes with county officials from Aiken, Edgefield, McCormick, and Saluda. SPEAKING WITH GROUPS – Several groups, clubs, and classes around our Senate district have invited me to attend their meetings and provide legislative updates. If you would like me to come and speak with your group, please let me know.